Nephrozoa is a major clade of bilaterians, divided into the protostomes and the deuterostomes, containing almost all animal phyla and over a million extant species. Its sister clade is the Xenacoelomorpha. The coelom, the excretory organs, and nerve cords developed in the Nephrozoa. 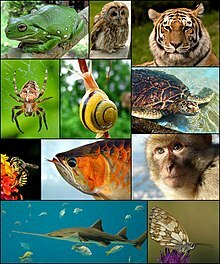 Chordates (which include all the vertebrates) are deuterostomes. It seems very likely that the 555 million year old Kimberella was a member of the protostomes. If so, this means that the protostome and deuterostome lineages must have split some time before Kimberella appeared — at least 558 million years ago, and hence well before the start of the Cambrian 541 million years ago. ^ Cannon, Johanna Taylor; Vellutini, Bruno Cossermelli; Smith, Julian; Ronquist, Fredrik; Jondelius, Ulf; Hejnol, Andreas (2016). "Xenacoelomorpha is the sister group to Nephrozoa". Nature. 530 (7588): 89–93. doi:10.1038/nature16520. PMID 26842059. Balavoine, G. (17 April 1998). "EVOLUTION: One or Three Cambrian Radiations?". Science. 280 (5362): 397–398. doi:10.1126/science.280.5362.397. ISSN 0036-8075. Lay summary. Bourlat, S; Nielsen, C; Economou, A; Telford, M (October 2008). "Testing the new animal phylogeny: A phylum level molecular analysis of the animal kingdom". Molecular Phylogenetics and Evolution. 49 (1): 23–31. doi:10.1016/j.ympev.2008.07.008. ISSN 1055-7903. PMID 18692145. Jondelius, Ulf; Ruiz-Trillo, Inaki; Baguna, Jaume; Riutort, Marta (April 2002). "The Nemertodermatida are basal bilaterians and not members of the Platyhelminthes". Zoologica Scripta. 31 (2): 201–215. doi:10.1046/j.1463-6409.2002.00090.x. ISSN 0300-3256. This animal-related article is a stub. You can help Wikipedia by expanding it. This page was last edited on 22 April 2019, at 02:03 (UTC).